Well, I guess that's what you call 'copybook'. Jenson Button won the Belgian Grand Prix at Spa in an imperious fashion today, leading all the way (that rarest of things in the age of the pitstop) the result wasn't really in any sort of doubt after a few corners of green flag racing. Yes, he was helped by a first corner accident rubbing out a few potential rivals, but the best evidence from qualifying and from Jenson's subsequent race performance is that he had the legs of them anyway. Jenson seems to have a sixth sense of what to do when the weather throws in a few variables. This weekend it was a Friday rain washout which left everyone with some guesswork to do for how they'd set their cars up for when it mattered on dry Saturday and Sunday, and Jenson found the sweet spot. He blitzed the field in qualifying, and which left him perfectly poised to do the same on race day. This he indeed did, looking smooth and assured all the way through, stopping to change tyres only once via displaying his usual sensitive touch on the Pirellis. When Jenson's happy with what's underneath him he can be unstoppable; today was one such day. It shows F1's ability to change things utterly in the space of a single weekend. On Friday in Spa the air was full of talk of Jenson, after a season of relative struggle, having to subjugate his own personal ambitions in assistance of his team mate's title bid for the year's remainder. Two days later things look much brighter for Jenson with 25 points for his win and some other contenders not scoring, though it remains the case that he's 63 points off the table top and has five drivers ahead of him. Still a long shot in other words - but at least he's made the title win a bit less improbable for himself. The first corner smash to a large extent framed the race; what the modern parlance calls a game-changer. Spa's opening tight La Source turn on lap one is usually a battle of survival, and it performed to form this year. Not for the first time in 2012 Romain Grosjean showed poor awareness at the start, this time taking it upon himself to swerve across the width of the track under minimal pressure and into Lewis Hamilton who had nowhere to go, and the subsequent contact send them careering into championship leader Fernando Alonso and the two Saubers rather like a bowling ball knocking over the pins, in a sickening impact that more than one were lucky to walk away from. Only Kamui Kobayashi could continue, albeit damaged, and the rest were out on the spot. 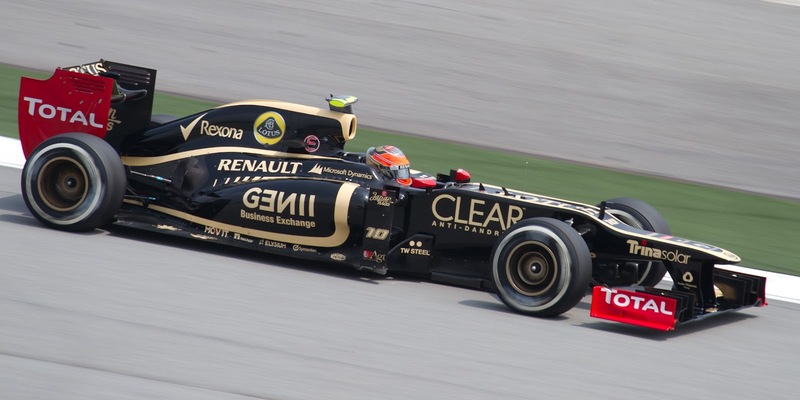 Grosjean was rewarded with a race ban for his actions. It's hard to defend what he did as it was egregious and as mentioned it's not the first time he's done something of this ilk. But it seemed a little harsh as a sanction, especially by the standards of previous cases. It was also disturbing to hear the FIA state as part of its justification for the penalty that the crash 'eliminated leading championship contenders from the race', which surely is not relevant; F1 drivers are (or should be) equal before the law. Both driver and team have accepted the punishment, however. The smash left us with a rather odd, depleted race, with the likes of Alonso and Hamilton out and the rest of the competitors jumbled. Button quietly disappeared into a race of his own as mentioned, and behind him Kimi Raikkonen gave us yet another of Lotus's Waiting for Godot-type races. Once again we all thought that the Lotus would a genuine challenger at the very front on race day (even without their much-vaunted rear wing 'device' this time), once again the pace was underwhelming when it really mattered. 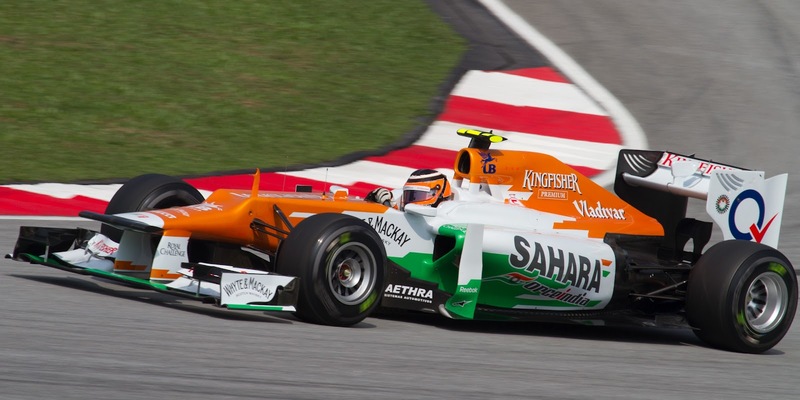 Kimi was in second place behind Button after the first corner accident, but couldn't get on terms in the first stint, indeed even sinking behind Nico Hulkenberg and Michael Schumacher. His laptimes did perk up after his first, early, tyre change, but a two-stop strategy plus a set-up and dud KERS that didn't make passing easy (quick through the turns but conceding a lot on the straights) and handling that wasn't quite to Kimi's liking meant that third place, 25 seconds shy of Button, was his lot. Still, it edged him nearer to the drivers' table top, and if we ever live to see the Lotus 'device' and it's half as good as its hype a championship run may yet be on. Jenson and Kimi were split by Sebastian Vettel, who put in a strong, combative drive to second. After the La Source smash Vettel was down in 12th place, but after showing for the thousandth time that he can pass after all, and like Jenson putting a one-stop strategy to good use, he was a comfortable second by the end. He now is a clear second in the drivers' table too, and within a win of Alonso at the top. It was an impressive save by driver and team, but it'll be less of a comfort to Red Bull that its car was off the pace here (in qualifying at least) and was a little saved by circumstances. Another to benefit from circumstances was Nico Hulkenberg. The first lap jumble pole vaulted him up to third place. But then he simply stayed there by running at the leaders' pace, even taking in an early pass of Raikkonen before finishing fourth eventually but two seconds shy of him on a similar strategy. I've not always been the greatest fan of Hulkenberg but he's doing a good job of proving me wrong in recent races. And it's all timely given he's being mentioned in despatches as a contender for a Ferrari seat alongside Alonso for 2013. Some even have him as the favourite for that ride. And we were also treated to a 'life in the old dog' run from Michael Schumacher, who showed a lot of his old Spa form and even ran as high as second for a time. However, his race was scuppered by attempting a one-stop strategy which the Mercedes's ability to chew tyres didn't allow. He eventually had to admit defeat and pit for a second time, meaning seventh was his relatively meagre reward (though he was perhaps a little fortunate to survive unscathed from the stewards' room after crossing Vettel's bows sharply heading into the pits at mid-distance). One who didn't even get meagre reward was Pastor Maldonado. If ever a weekend was his season in microcosm this was it: he showed brilliant pace to qualify third, but was almost immediately shunted down by three places for impeding Hulkenberg early in the session. And today he jumped the start by what seemed an age (he claimed that his hand slipped on the clutch - though we can at least say that the jumped start had absolutely nothing to do with the first corner accident, contrary to some frankly ridiculous claims), and after pitting for a puncture drove into the back of Timo Glock promptly when the race got going again after the safety car. It put him out, and the accumulative effect of the two offences means he'll face a ten-place grid drop next week in Monza. I've always sought to defend Maldonado, but he doesn't half make it difficult sometimes, especially as the 'lost' points that his prodigious pace should be rewarded with pile up (and today Williams dropped behind Force India in the constructors' standings). It's all a pity, as if he can ever cut out the errors he'd be a very fine F1 driver. But it wouldn't be Spa if it didn't give us a few things to talk about. And while in its own way it didn't give us much that was spectacular, Jenson Button's fine drive should be the biggest talking point of all.